This nourishing waffle batter is made from cashews, coconut flour, and arrowroot. The cashews give it a more bread-like texture than coconut flour, and the arrowroot gives it some lift. I’m finding that sugar-free breads are best with a little bit of starch to improve the texture. Tapioca also works well here. Arrowroot and tapioca are largely interchangeable when used in small amounts in baked goods. In spite of the fact that the starch adds carbs, the overall carb count is low per waffle, making these waffles a super tasty diabetic-friendly breakfast option. Cashews are a bit of luxury item. I buy them in bulk for cost savings. Food To Live is my preferred brand of cashews on Amazon due the freshness of the product. I’ve never received a bad batch from them. Of course, waffles are always better eaten with a knife and fork, topped with soft butter and glossy syrup. To keep it low carb, I use Joseph’s Sugar-Free Maple Syrup. It’s the thickest, sweetest, sugar-free (and Sucralose-free!) variety on the market. It handily trumped the Maple Grove Farms Vermont Sugar-Free Maple Syrup in a blind taste test. You pick it up at Whole Foods ($3.99), or purchase it through the affiliate link above. Because Joseph’s Sugar-Free Maple Syrup contains maltitol, I limit my portion to a light drizzle (roughly 2 Tablespoons). Although maltitol is sugar free, it is not carbohydrate free. According to diabetes expert David Mendosa, maltitol has a considerable impact on blood glucose levels. Most sources say to count 3 calories per gram, or 75% of the carbohydrates in the maltitol-based product. Based on that conversion, each tablespoon of Joseph’s syrup would contain 2 grams of carbohydrates. Compared to 13g carbohydrates per Tablespoon of real maple syrup, that’s a pretty sweet deal. Lately, I’ve been noshing on these waffles in the car on the way to early morning photoshoots. I was fortunate to be hired as a photography assistant with a company that takes portraits of school children. It’s a high energy, fast-paced seasonal job that is giving me some experience working with professional lighting equipment and interacting with lots of smiling faces. The best part, far and away, is posing the kiddos! I enjoy working with all ages, but the 3rd and 4th graders steal my heart. They’re old enough to follow instructions, and young enough to think it’s still cool to smile. Which, of course, it is. 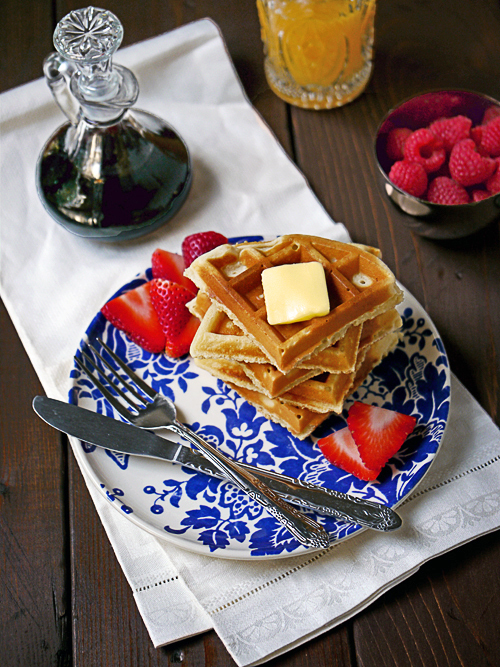 May these waffles bring you lots of smiles. 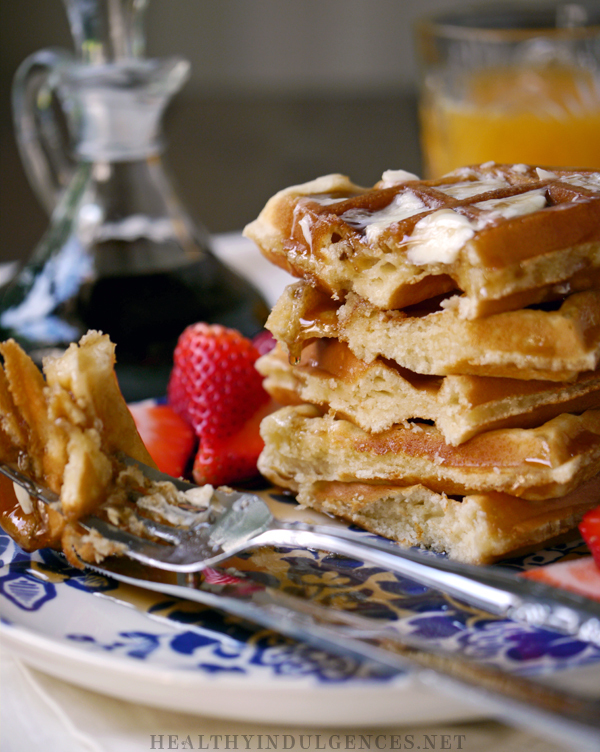 These fluffy, gluten-free waffles can be prepared in minutes using a high speed blender. Preheat a nonstick waffles iron to the medium-high setting. Add wet ingredients to blender excluding milk and coconut oil. Add milk and coconut oil to a glass measuring cup and heat for 1 minute, or until liquified. Add to blender. 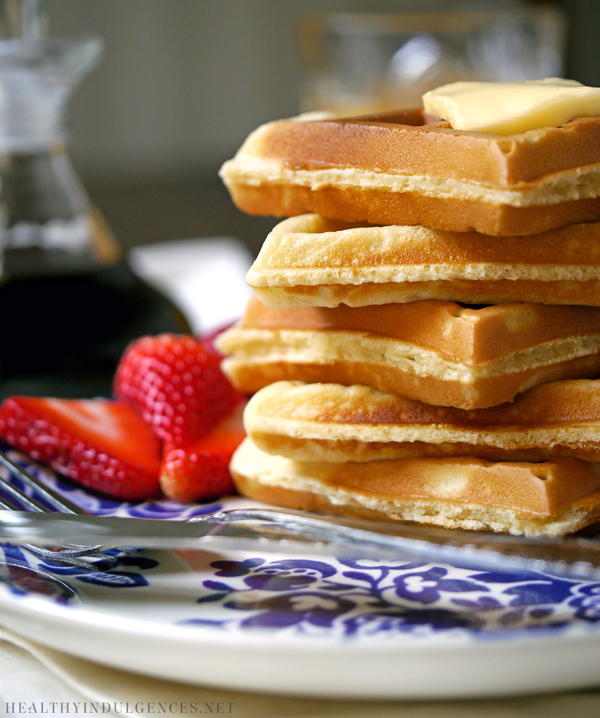 You want the batter to be warm so that it is runny enough to spread out in the waffle iron. Add dry ingredients to blender. Blend on low setting, turning it up to the highest setting for 30 seconds. Immediately pour batter into preheated waffle iron. Cook for 3 minutes, or until golden brown and cooked through. Remove waffles with a fork or spatula. Serve immediately. Alternatives, cool waffles on wire rack and store, wrapped in paper towels, in zip top baggies. These freeze very well! *Refined coconut oil works well if you don’t prefer the coconut flavor that extra virgin coconut oil gives these waffles. Stay tuned for some fun projects in the works! I’m shifting gears with my content in order to better meet the needs of the diabetics and other sugar-free eaters who are searching for recipes compatible with busy lifestyles. Woot woot! I love waffles, thank you so much for the recipe! I have made them with cashew meal before, and they always turn out great. I love the addition of the flaxseed–always looking to add more fiber! Good to see you again, Lauren. Brandon, it’s good to hear from you, too. 🙂 The flaxseed is a good binder! I’ve actually found that you can leave it out in these waffles, though. What’s your favorite new recipe? Please link to so that I can get an idea of what to make! Thanks for the recipe Lauren!! I have followed you for several years, and have loved your blogs, and recipes! As for this recipe, I have a question. On step 5 of the instructions, I assume waffle iron rather than blender (as the ingredients are already in the blender. 🙂 )? Typo? These look amazing and I can not wait to try them! The nutrition info isn’t showing on my phone! Can you tell me the carb count for both ways!? Thanks so much!! 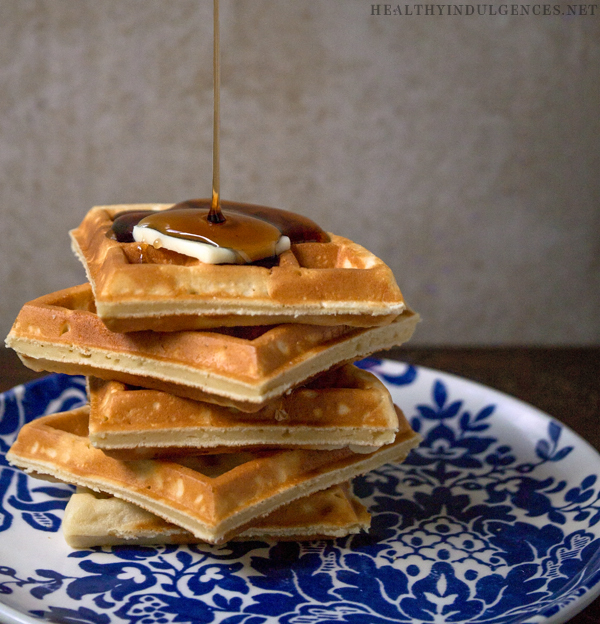 I’m SO excited I came across this recipe… the week I found out I had gestational diabetes, my mom had bought a waffle iron for me and I haven’t been able to use it!! I know what I’m making this weekend… I don’t see the nutritional information… can you post that? Thank you!!! Now a couple Qs.. I don’t see the nutrition info on here.. am I being clueless? Also, the oat flour would be to replace the coconut flour or the arrowroot starch? Ah, nevermind on the replacement question, Lauren, it was right there in big asterisks. can I use almond flour in the place of the oat flour? I made these today and loved them. I entered the recipe into myfitnesspal minus the flax since I didn’t have any and it was 39 carbs per serving with 9 fiber. Pretty high for low carb, even with the oat flour. I made 5 waffles as per servings listed. But they were delicious! Can I make them at night for breakfast? March 19, 20n01nbsp;&1bsp;&6:42 by janh Spot on. I’ve found that money plays no role initially. It is opportunity (i.e. a challenge to solve something), ability (some people are naturally more innovative than others) and leadership (this includes all aspects, but in summary a positive and nurturing relationship with the supervisor and positive identification with the company). So, money, initially – no. However, it must be rewarded in order to retain the person. Aw come on don’t rain on the parade. Celebrate! Bask in it. Breathe it in. America is finally thinking and considering just what it means to “abort”. I agree that Roe v Wade isn’t likely to change next year, but it is a start. High Five, Sanity! Went to a come and try archery day at a local archery club today, and my 8 year old had a go too. Loved it. Time was limited – it was a free event, gear supplied, and lots of people were interested, but I was able to loose 18 arrows from a 20 pound recurve bow, all hitting the target, and a couple of those shots hitting the centre ring! I will have to wait months before I can go shooting more regularly though, as you have to complete a three week beginners course first, and that’s booked out all the way to next April. May 24, 2012 Elyse, I like how you balance the unsettling part of the animals in the pick-up truck with the local reality and the driver for that approach. I also wondered what if the Easter bunny were IT for us (as the Easter goat is to them) and not chocolate?? LOLNeat insight for us readers about Easter, Ethiophia and the local market! Hello! Awesome recipe, but would you mind posting the nutritional information? Especially important for diabetics. Thanks!